On Penguin Vacation from Playtech, a family of penguins are heading off on their holidays. There’s a mum and dad penguin, and a little one too. We join them in a suitable environment for a penguin, although it’s unclear if they’re vacationing a few miles from their home, or perhaps they’re in the Arctic, who knows? It’s a simple enough game to get the hang of. There’s three rows of symbols and five reels, and a total of 20 possible pay lines. 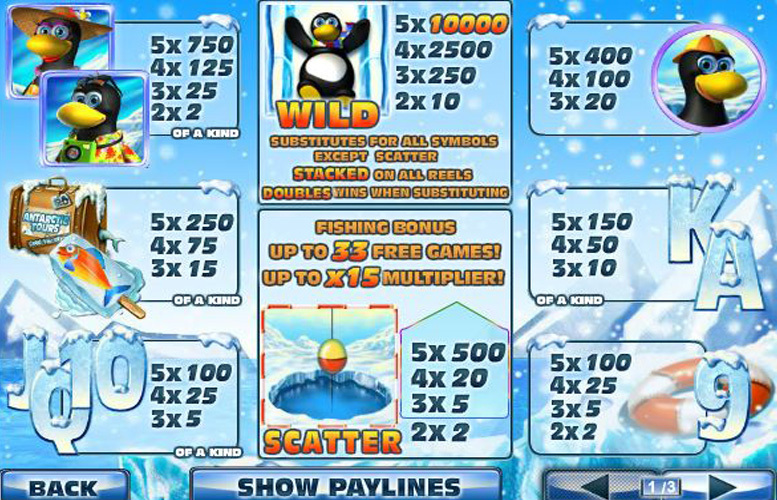 The game offers a very generous top jackpot as well as a lucrative free spin money, and the always fun “gamble” option. Perhaps the inclusion of an extra bonus round would make the whole title stronger, as it stands, it’s by no means a favourite. Nice theme. Bright colours, and well-designed symbols. Players get full control of their betting. More on that later. Gamble feature can quickly make or break your session. An extra bonus feature or two would be nice. Soundtrack gets annoying quickly. It can be muted easily however. Hitting three ice hole fishing symbols anywhere on the reels activates the Fishing Bonus. The base level in this round is eight free games with a 2x multiplier, and selecting a fishing hole will reveal additional prizes. You get two shots at this before the spins start up. 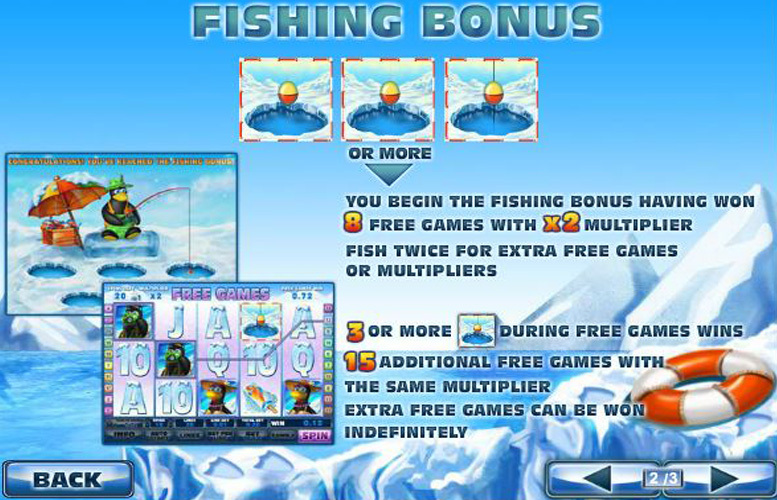 During the free spins, if you’re fortunate enough to hit another three fishing holes during free spins, you’ll be awarded with 15 extra free games with the same multiplier you won from the original bonus. This dynamic can occur indefinitely too. The wild symbol often appears stacked on the reels. What’s more, on any winning combination where the wild substitutes for another symbol, the value of the win is automatically doubled. This can make for some seriously juicy pay outs. Players get the opportunity to gamble any winnings they make during any single spin. There’s a button located next to the spin one that’s labelled gamble. If players opt to gamble they can do so by clicking this when highlighted. When gambling winnings, players are betting on a simple red or black guessing game with a deck of cards. Get it right, double your money. Get it wrong, and you walk away with nothing. Players can continue to gamble up to a maximum of $5,000. 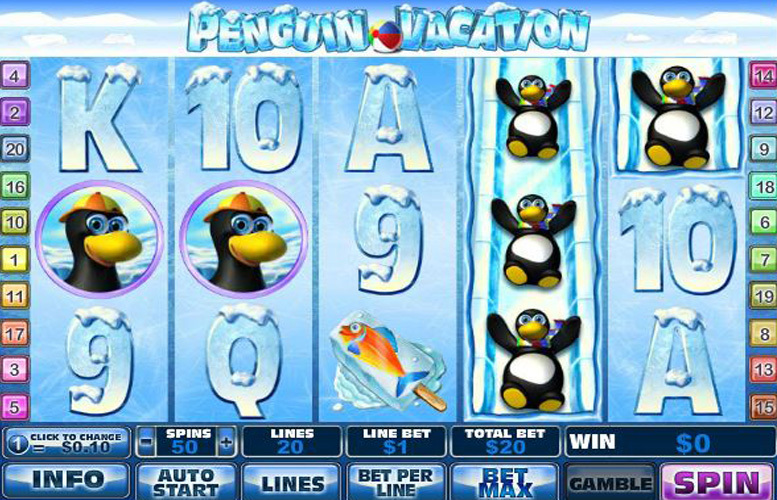 An area that Penguin Vacation shines in is that it allows players the greatest of control over how they spread their money out across the reels. They can choose exactly how many pay lines are active, how many coins to bet per line, and the value of each of these. That makes for a lot of ways to vary wagering. The minimum bet possible is by using just one pay line, with one coin bet on it, and with a coin value of 1p. This obviously costs 1p per spin. By contrast, the highest amount a player can wager per spin is an 8p coin, across all 20 lines, betting 10 coins per line. That would make each spin cost £16. Clearly, this game isn’t one for the higher rollers. Penguin vacation is a lot of fun. It’s nicely designed, with a modern fresh feel to it. The game’s main bonus feature is lucrative and the top jackpot is huge. Admittedly, this slot isn’t suitable for high rollers, and many people will likely find the £16 maximum bet a big turn off. The gamble feature is a nice addition, although it may have come at the expense of an extra true bonus feature. Having all winning combinations that use a wild symbol doubled makes a big difference to the return-to-player rating, but it doesn’t make a big difference to the excitement factor. This game has a rating of 4 / 5 with 378 total reviews by the users.